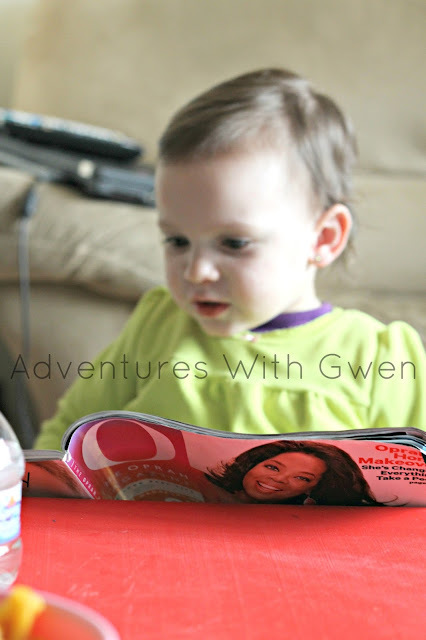 Adventures With Gwen: It's OK Thursday. ...to be SUPER SUPER excited that my sis-in-law and bestie BOTH found out what they were having yesterday... let the shopping begin!! Congrats to you both btw, you guys are going to be great parents! ...to be a little jealous of all the baby making going on around me. I have not been cured of the baby fever yet. ...to not really care about American Idol, at all. Sorry, peeps. Although I am not a Nicki Minaj "hater," she makes me want to throw the tv through the window. The nonsense that flows out of her mouth makes no sense. at. all. ...that we have watched Wreck-It Ralph probably about 10 times since it came. We love it. Lol. ...that Gwen is currently obsessed with an issue of O Magazine that she took from her Wela's house. And that she is currently saying that it is her "favorite book." Ummm... ok. lol. Yay for Friday! And for the end of this frigid week to be here! I am going to ignore the fact that the weatherman said snow just a few more times than he should tonight. No. More. Snow. I beg of you! I am so there with you, I don't get into Idol or any other reality show for that matter! I do not know what is up with that NM, we already have a Lady GaGa!! I hope it warms up for you soon, the Easter Bunny can't hop through the snow can he?